Eureka police are seizing firearms at a staggering rate. The question is, why? Courtesy of EPD The Eureka Police Department seized more than six firearms per 1,000 city residents in 2015, a rate that nearly equals those of police departments in Oakland, Baltimore and Chicago combined. Photo by Mark McKenna Officer Ed Wilson holds two rifles EPD seized as evidence during a recent investigation. Courtesy of EPD EPD Chief Andrew Mills has taken to telling his officers that “dope and guns” often come as a package. 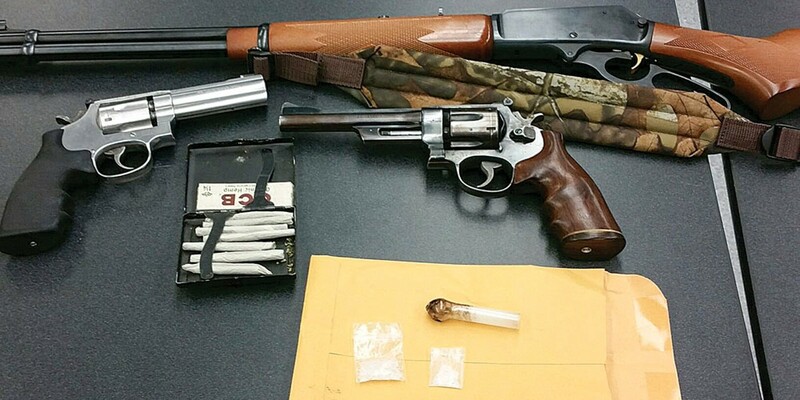 In this case, officers found 10 guns at the scene of a recent methamphetamine bust. Photo by Mark McKenna Mills points to a photo of an AR-15 amid his collage of guns seized by EPD officers in recent months. There was the black .45 caliber handgun investigators picked up next to a dead 20-year-old at the scene of a shootout with a California Highway Patrol officer on Q Street. 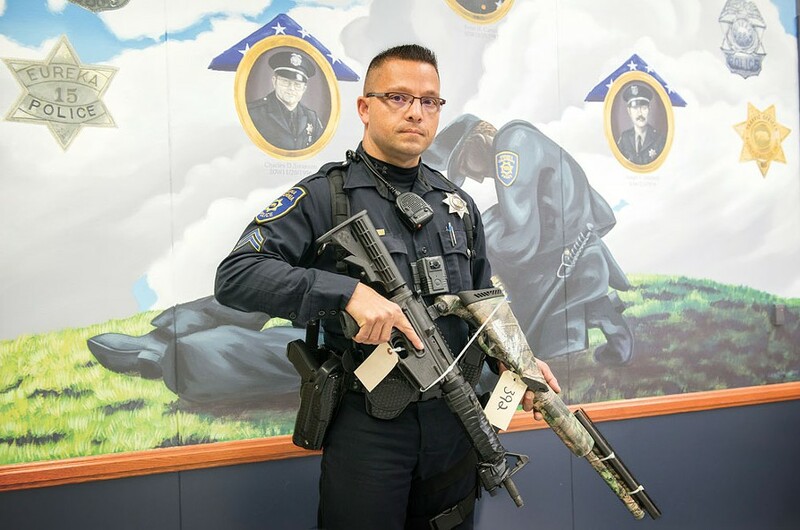 Then, about a month later, there was the loaded AR-15 style assault rifle with high-capacity magazines pulled from under the hood of a Dodge pickup truck in the Bayshore Mall parking lot. More recently, there was the loaded pistol officers found underneath a man nodding off in his car, with the engine idling and a hypodermic syringe still in his arm, at a gas station on Broadway. 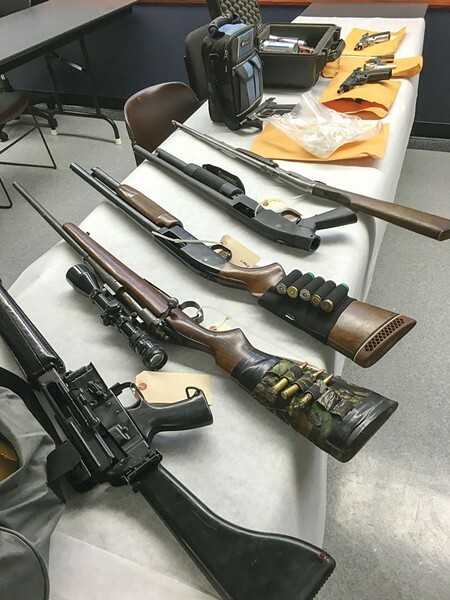 The Eureka Police Department seizes guns of all types, from snub-nosed revolvers and semi-automatic pistols to hunting rifles and shotguns. And it takes the guns for a host of reasons: some because they were used in a crime; others because they are with someone who can't legally have them; and some simply for safekeeping. And, a recent Journal analysis reveals, EPD is seizing these firearms at a staggering rate — one seemingly unmatched in similar sized cities throughout the state and one that trumps some of the nation's largest police departments in its most violent cities. As Chicago surged its way to recording a nation-leading 468 homicides last year, its police chief made national headlines when he announced his officers were seizing a gun every 72 minutes, on average. When the year ended, officers in the Windy City had taken a total of 3,709 firearms off the streets, or about 1.36 per every 1,000 city residents. That same year, EPD officers seized 6.06 firearms per 1,000 city residents, a number that dwarfs every comparison the Journal made in its analysis of gun seizure records from more than 10 police agencies. In fact, the only agency to even approach Eureka's seizure rate was the Humboldt County Sheriff's Office, which clocked 4.48 seized firearms per 1,000 residents in its jurisdiction last year, according to the Journal analysis. Coupled with the county's homicide rate in recent years, the analysis makes clear there is a gun problem in Humboldt County and its epicenter sits in Eureka. No matter your views on gun control and the Second Amendment, the numbers indicate the area has alarmingly high rates of firearms falling into the hands of people who are either legally prohibited from possessing them or prone to making bad choices while holding them, and often both. "It's troublesome," says EPD Chief Andrew Mills. Perhaps most troublesome to Mills and his law enforcement cohorts is the local homicide rate. In the six-year period from 2010 through 2015, Humboldt County recorded 63 homicides, or about 7.84 per 100,000 residents annually. The national rate for 2014, the last year for which full statistics are available, was 4.5 homicides per 100,000 residents. Humboldt County's average of 7.4 would have ranked higher than all but two states in 2014, and far outpaced California's rate of 4.4. The vast majority of Humboldt's killings over that six-year period — including eight of the 10 in Eureka since Mills took over as the city's police chief in late 2013 — were the result of gun violence. 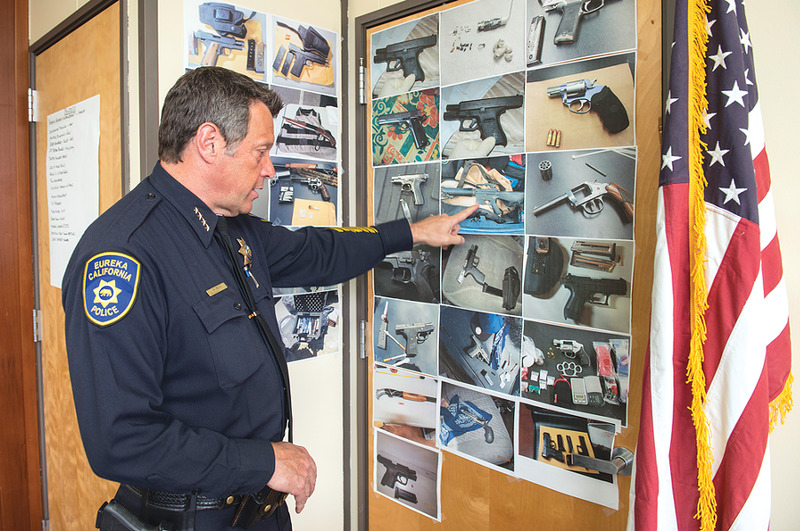 Across from Mills' desk at EPD headquarters sits a kind of collage, a smattering of about 30 8-by-10 photographs that wallpaper a door and part of the wall. The pictures combine to depict a small arsenal of guns that Mills' officers pulled from cars, pockets, hiding places and homes over the span of several months this year. Mills explains that there's a wide variety of ways that police officers wind up taking possession of a firearm. Most often, Mills says, the weapons are found during searches — of people, residences and cars. Sometimes these searches are the result of a warrant or probable cause, others come as part of someone's terms of probation or parole. But the police department can also take guns for "safekeeping" in some situations, like when investigating domestic violence complaints or referring people for mental health treatment because they may be a danger to themselves and others. Occasionally, guns are surrendered to the department voluntarily by concerned family members or people temporarily prohibited from owning them due to a restraining order. And, rarely, guns are simply found and taken to the department to be turned in. The numbers we got back were startling. First, we tried to find a comparably sized city with some similar crime problems to Eureka's. We settled on East Palo Alto, population 29,143, and learned its notoriously busy police department seized 36 firearms in 2015, or 1.24 per 1,000 residents. Then, we talked to some people who pointed out that, as the county seat, Eureka's population swells during the day, making it similar to cities twice its size. So we looked at some cities of 60,000 or so residents: National City seized 104 firearms in 2015, or 1.74 per 1,000 residents; South San Francisco seized 21 for a miniscule .38 firearms per 1,000 residents. Realizing those cities might be too urban for a fair comparison, we looked at Sutter County's Yuba City, tucked along a small mountain range about 40 miles north of Sacramento. 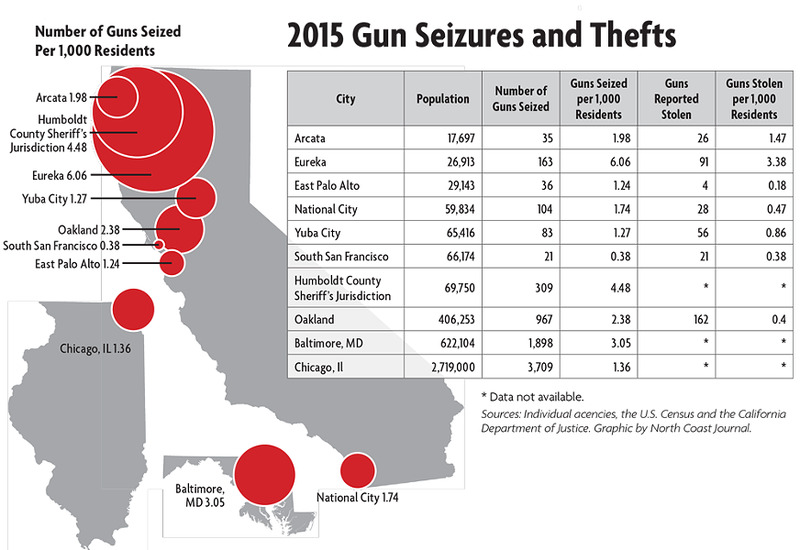 With a population of 65,000 — more than double Eureka's 26,913 — Yuba police seized 83 guns last year, 1.27 per 1,000 residents. To try to put those numbers in some perspective, we got some data from some of the nation's most notoriously violent cities: Oakland, Baltimore and Chicago, which combined to record 772 homicides in 2015. Baltimore seized 3.05 guns per 1,000 residents; Oakland 2.38; and Chicago 1.36. From the Journal's analysis, it's clear EPD — as well as the sheriff's office — is seizing weapons at a very high rate, but it's incredibly difficult to pinpoint why. First off, there's no way to quantify how many guns in any given city are illegally possessed. The numbers we have are just those that police actually find. Maybe Eureka's officers are just really good at finding guns, or maybe Eureka criminals are exceptionally bad at hiding them. Bit there's not even a way to find out how many legal guns are out there in any given city or county, making comparisons difficult. It all seems so simple on crime shows: A cop finds a gun at a murder scene, takes it back to the precinct and types the serial number into a computer that instantly spits back a full history of registered owners. But that's not at all how it works. When a police agency wants to find a firearm's origin, it has to turn to the ATF for help, which agencies did 344,000 times in 2015, according to the bureau. When ATF receives a request, its agents hit the phones. First, they call the firearm manufacturer, which can check its records and pass on which wholesaler it sold the gun to. Then, agents call the wholesaler, which should be able to pass on the name of the retail gun dealer, who should in turn be able to tell agents who purchased the gun. That's the best case scenario: that a string of phone calls will help ATF agents find out when, where and by whom the gun was originally purchased. There's no tracking of subsequent sales and transfers, and no way to compile a complete chain of legal ownership. And in the worst case scenarios, say when the gun retailer has gone out of business, these traces can turn into weeks-long endeavors. By law, if a gun seller is closing its doors, it has to turn all of its sales records over to the ATF. These records are often in paper form and show up at the ATF's tracing center in West Virginia by the truckload — sometimes 3,000 boxes at a time, according to a recent story by National Public Radio. Agents then have to painstakingly leaf through thousands of documents to find a record of sale. "The idea that we have a computer database and you just type in a serial number and it pops out some purchaser's name is a myth," ATF Special Agent Charles Houser told NPR, pointing to a table filled with battered, burned and waterlogged records. "These look like the Dead Sea Scrolls to me. These are Hurricane Katrina records we kept. Businesses went underwater, and they went out of business. But they still shipped their records here, and we dried these out in the parking lot." In 2015, the ATF traced 37,043 firearms seized by police in California during criminal investigations and was able to identify the "source state" 23,716 times. Seventy percent of those traced guns were first sold in the Golden State, with an average of 13 years passing between the gun's initial sale and its use in a crime, according to an ATF report. California is known for having some of the strictest gun laws in the nation, but there's little on the books that helps police keep track of firearms. Under state law, residents must report firearm ownership to the state Department of Justice and register them into its Automated Firearms System. But this information is not public and there are limits to the extent to which police can even access it. When we contacted DOJ trying to figure out how many guns were registered in California, and in Humboldt County and Eureka specifically, a spokesman said that wasn't information the department had. For his part, Mills said EPD doesn't even bother attempting to trace most of the firearms it seizes, believing the investment of time and resources needed isn't worth the limited information that comes back. It seems the only public data about geographic gun ownership comes in the form of concealed carry permits, which have to be approved by the local sheriff and are a matter of public record. According to a report by the Center for Investigative Reporting, Humboldt County had 869 active concealed carry permits at the start of 2015, accounting for about 1.23 percent of active permits in the state. Humboldt County is home, meanwhile, to about .3 percent of the state's population. It's hard to say whether concealed carry permits are a good indicator of overall gun ownership rates, but they're the only real metric we have. But they give little to no indication of why police seizures are so high locally. As Mills says, the majority of guns seized by his department aren't registered and aren't legally owned. Asked why his department sees so many guns, Mills doesn't pause to think. To start, he points to a "very heavy" gun culture here. Hunting is a way of life for many, and there are hosts of self protection advocates and "Second Amendment types." Then, there's the dual cultural legacies of Humboldt County's billion-dollar illicit marijuana industry and its staggeringly high drug addiction rates. "The drug culture here in Humboldt County is certainly as pronounced as I've ever seen and many of these people are armed to the teeth," Mills says, adding that people have guns to protect crops, stashes and cash, and that he's taken to telling his officers that "dope and guns" go together. Sheriff Mike Downey agrees, saying it's rare to see a drug raid in Humboldt that doesn't turn up firearms. "There's a drug culture here where guns are very prevalent," he says. But Mills, Downey and others contacted for this story say the issue is far more complex than Humboldt County's drug culture and that there are likely a host of other contributing factors. For example, Humboldt County's rates of domestic violence run roughly 50 percent higher than the state average, which could mean local departments are taking more firearms for safekeeping after domestic violence reports than agencies in other parts of the state. Without better data, there's simply no way to know why Humboldt County's numbers skew so high. Mills, however, has a theory. He thinks Eureka's high rates of firearm theft contribute mightily to the numbers of guns on the streets and in the hands of people who shouldn't have them. Statewide in 2015, about .26 firearms were reported stolen for every 1,000 California residents, according to statistics from the Department of Justice. In Eureka, that number was 3.38 — a 13-fold increase. It bears noting that Eureka's 2015 theft numbers skew high due to the burglary of a local sporting goods store that saw dozens of guns stolen. But the department still recorded 2 firearm theft reports per 1,000 residents in 2014, and was on pace to record 2.2 through the first quarter of this year, both numbers being more than seven times the state average. These high theft numbers make some sense. After all, it appears — anecdotally and through the only metric publicly available — that Humboldt County has high gun ownership rates. Eureka has very high property crime rates, including vehicle break ins and burglaries. And Mills says stolen firearms have an immediate black market waiting for them, making them a more lucrative target than flat screen televisions and electronics. Last November, a frustrated Mills abandoned his push for a city ordinance that would have made it a crime for people to leave their guns unattended and unsecured when away from their home or business. In Mills' eyes, the idea was straightforward: "People have a right to bear arms, but that's just the point — to bear arms. Not to leave them lying around unprotected," he said at the time. "[The proposed ordinance] was written specifically so if someone is home or at their business, they can have all the guns they want lying about because they're in control of their firearms. It has nothing to do with, 'When somebody goes to bed at night, can they have a gun on their nightstand?' Of course they can. This is America." But the proposed ordinance drew a fierce and immediate backlash from some who felt it was an infringment on Second Amendment rights. Mills dropped it, opting instead for a public education campaign under the mantra, "Hide it. Lock it. Keep it." Mills said he feels conflicted about gun issues locally. Asked if he would support laws that made it easier to trace guns and their owners, Mills says it makes him uneasy as it could be seen as an infringement on people's rights and he's not sure how much it would really help. After all, he suspects lots of the guns his officers find in Eureka have been handed off multiple times since their last legal sale. But the day-to-day reality faced by his officers is untenable. "In some ways, the Second Amendment people are right: This gun is not going to get up and shoot someone on its own. But people make bad decisions. As a society, we are proving that over and over again," he said. "I think it's the same pattern everywhere. Certainly, no county has been immune from gun violence." Mills sees gun violence as a complicated knot of mental health and addiction issues, drug cultures and the prevalence of firearms. It's about families and support systems, social services and communities. It's about multiple systems failing at once. Sitting behind his desk and glancing at his wall of photos, Mills sighs. "Those are the kinds of things that, if we don't come to grips with them as a society, this gun thing is going to spiral out of control."